Could anyone tell me where to locate a map of Rumbling Falls Cave, Tennessee? Was jsut there this past weekend and loved the amount of work it took a team of three to get to suprise pit! Im really interested in seeing where the other passages are. PM me if its a sensitive subject. I have not been to rumbling falls ( I looked at the entrance once :) and so could be wrong, but I beleive surprise pit (at least the one I am familiar with) is located in a different cave called ellisons. I know RF was mapped but the only map I have seen is the one that was published in the Sports Illustrated article a few years ago. Was a map ever published in the NSS News? Scott McCrea wrote: I know RF was mapped but the only map I have seen is the one that was published in the Sports Illustrated article a few years ago. Was a map ever published in the NSS News? The 2005 NSS Convention Guidebook (Huntsville, AL) includes a map of Rumbling Falls. 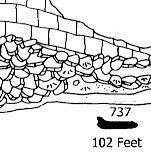 I just got out my 2005 NSS Convention Guidebook and I don't see a map of Rumbling Falls Cave in there. Was it a loose insert? If it is in there, what page is it on? and I mean that in the way that though there is one, you get all sorts of different leads to different caves! Larry E. Matthews wrote: I just got out my 2005 NSS Convention Guidebook and I don't see a map of Rumbling Falls Cave in there. Was it a loose insert? The Rumbling Falls map was included in a fat map packet which came with the guidebook, though it is sadly a single 8.5x11 sheet. This map has my favorite scalebar of any cave map: a Boeing 737 jetliner. The map is in SERA 2003 Guidebook, pages 28 & 29. You can probably purchase one from the NSS. Thank all of you for your replies !!! I am working on a book about the caves of Fall Creek Falls State Park here in Tennessee. Since the copyright owner of the Rumbling Falls Cave map does not want it published in the book, I was going to refer NSS Members to go to the 2005 NSS Convention Guidebook to see a copy. I may still do that, but note that it was a loose copy in the Convention materials. Of course, that won't help most readers of the book, because they will not have a copy or have access to the 2005 Convention material. Naturally, we will NOT publish the map without the copyright owner's permission. Nice idea for a book Larry. Will you be featuring only the big ones, or are you trying to include all of the caves on FCF property? want the good publicity that would come from that. Only the big, well-known caves. The State actually has a permitting system now for some of these caves. This area may prove to be a Mecca for caving, as private land gets harder and harder to get permission to go on. Rumbling Falls Cave, for example, was featured in Sports Illustrated Magazine, and has been in all the Tennessee newspapers. It is NOT a secret cave. Nor are Lost Creek Cave, Camps Gulf Cave, Virgin Falls Cave, etc. This will cover the old portions of the Park, the new Bridgestone (Camps Gulf) addition, Scotts Gulf, and a State Wildlife management Area and a State Forest, all continuous to one another. It takes 4 topo maps to cover it all.